When you buy a Used Bike from our dealership, our first priority is to ensure that you are completely satisfied with the motorcycle that you have chosen and confident in its ability to meet your needs. We know that you have a choice when you buy a motorcycle and that quite often that choice can seem confusing in terms of precisely what you are getting for your money. So when you buy a TeamMoto Approved Used Bike from Blacktown Yamaha you can be sure that the motorcycle is genuine in terms of its history, that it has been prepared for sale to a clearly defined standard and that it represents excellent value for money. Our Approved Used Bike program has been developed to make buying a Used Bike easier and, most of all, a genuinely pleasurable experience. 2-Day Free Exchange! A second chance to get it right within 48-hours of your purchase. 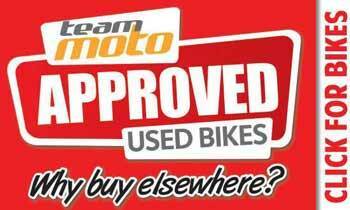 It's that simple, you just choose another TeamMoto Approved Used Bike to the same value. 90-Day Warranty Extension! Every TeamMoto Approved Used Bike comes with a 90-Day Warranty extension for FREE when you purchased a one, two, or three year warranty.